Appearances can be deceiving. 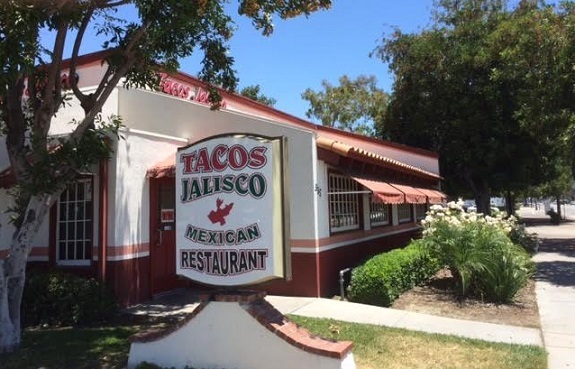 For years I’ve driven past Tacos Jalisco, housed in a dull-looking restaurant that might well have begun as a Spires, and assumed it was a sit-down restaurant of dubious quality. Although the reference to a particular state in Mexico (Guadalajara is its capital) should have tipped me off that this wasn’t going to be a downscale El Torito. 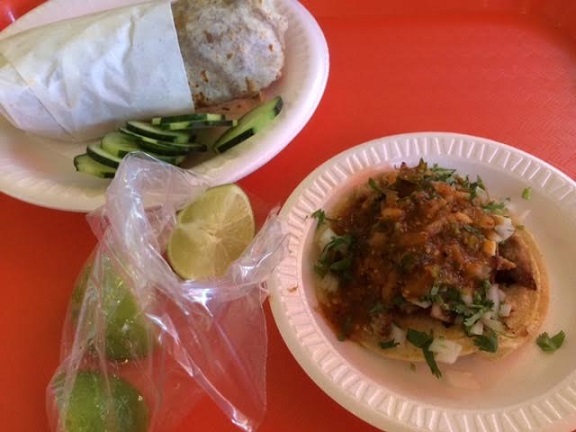 A taco-loving source at City Hall, which is nearby, surprised me by telling me Tacos Jalisco might have the best tacos in Pomona, up there with De Anda. 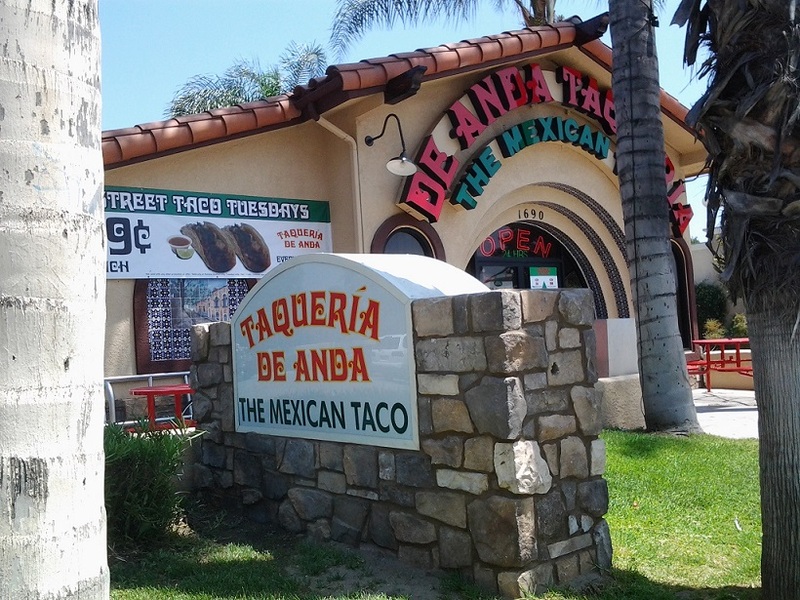 As I’d say De Anda and Tijuana’s Tacos are my favorites, this was credible information. (We would hope for no less from City Hall.) We walked there for lunch so I could judge for myself. The entry from Mission was as disappointing as it looked from the street — although one is conflicted about knocking gentility. 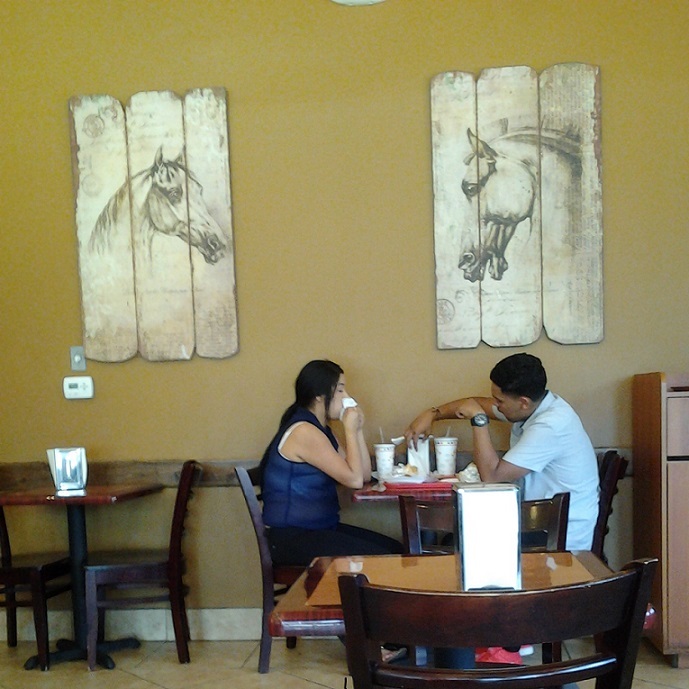 Inside, though, it turns out you order at the counter and sit in molded-plastic booths. This was more like it. For whatever reason, I had expected waitresses in costumes. It’s relatively nice inside, and clean. 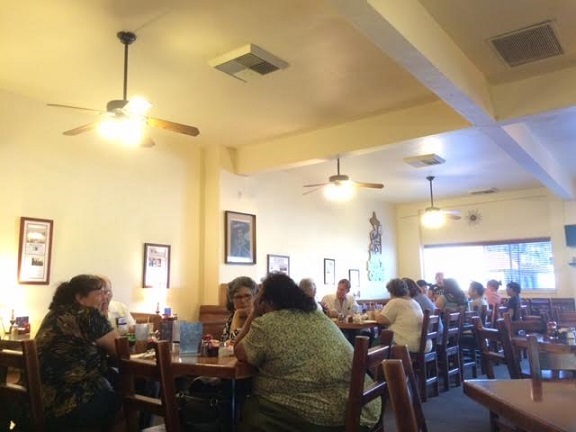 The menu has tacos, burritos, quesadillas, sopes and, on weekends, menudo and birria, and beverages include champurrado and aguas frescas. 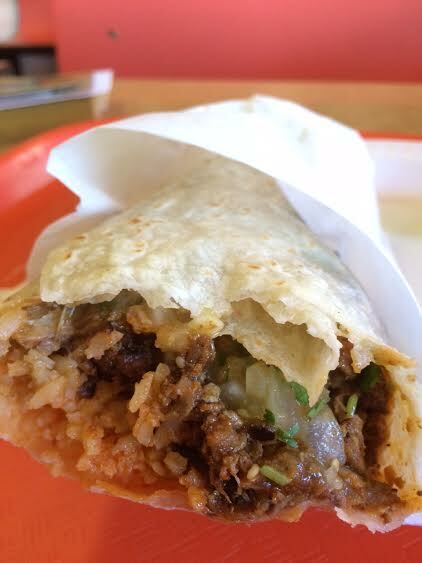 My source got a chorizo taco and al pastor burrito (below); I got four tacos ($1.24 each): al pastor, asada, carnitas and chicharron, plus a horchata ($1.40), meaning my entire lunch was $6.92. 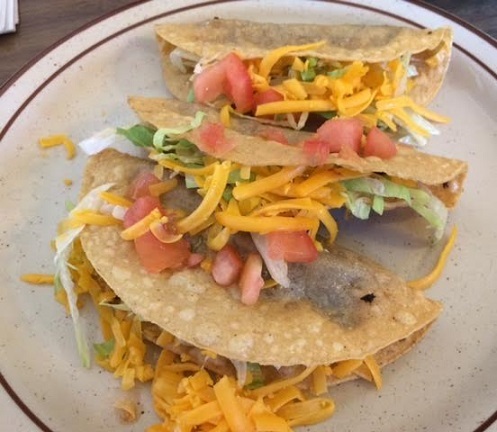 These were excellent tacos, and four made a good meal. A standout was the carnitas, which was redolent of porkiness. If they’d slaughtered the pig out back a half-hour before, it wouldn’t have surprised me (except code enforcement works close enough to have put a stop to that). I returned a month later for an al pastor burrito (around $6; final food photo) and a Mexican Coke. An excellent cheap meal. 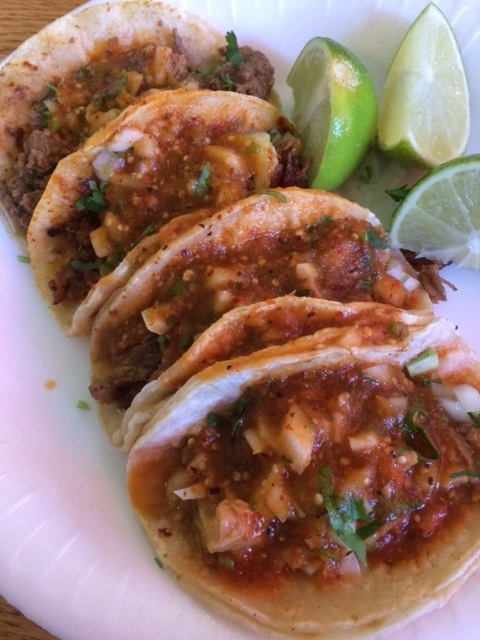 Best tacos in Pomona? Fistfights have started and friendships ended on lesser questions. Tacos Jalisco at this point is in my triumvirate alongside De Anda and Tijuana’s. 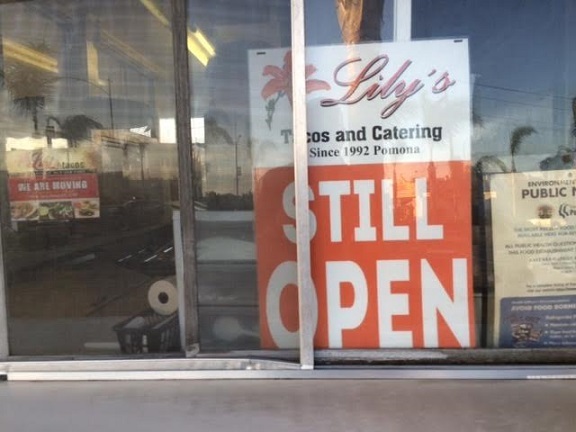 But wait, what about Lily’s? Oh. What comes after a triumvirate? I was on foot at Towne and Second one recent evening looking for a place to eat. 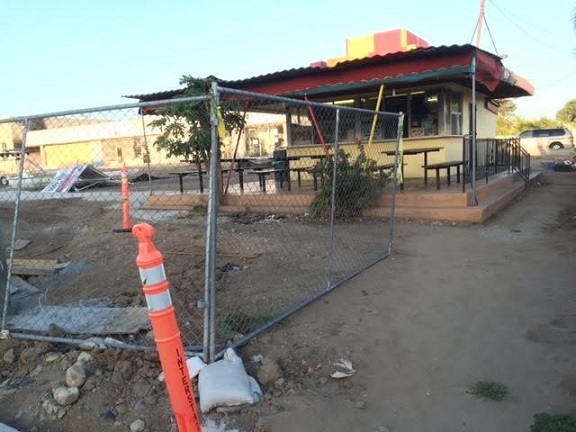 This proved more difficult than expected, as Los Jarritos was closed and Nancy’s Tortilleria, also on that corner, was closing. I’d left my car in the garage at Western U figuring I could find grub nearby. 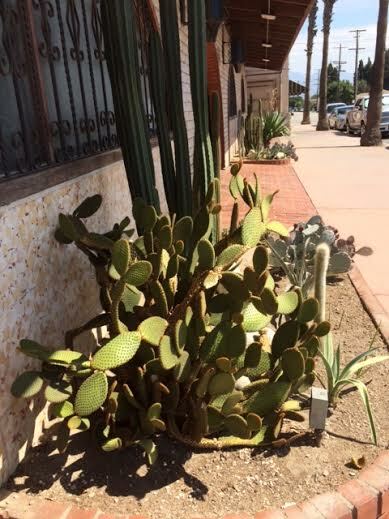 But I pressed on on foot, knowing Mission Boulevard three blocks south would have a few options. And it did. 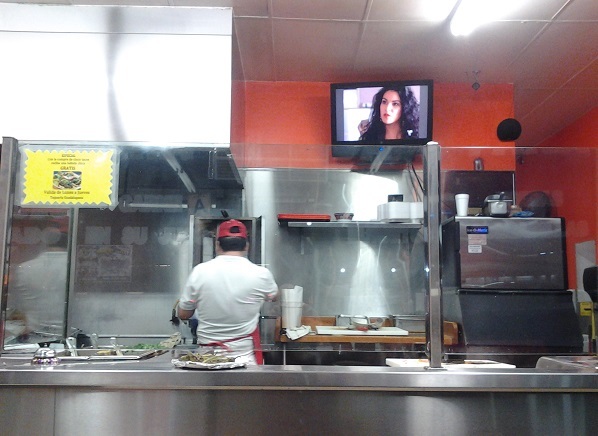 I opted for a place on the southeast corner: Taqueria Guadalupana. The broad windows and brightly lighted interior were friendly and welcoming. 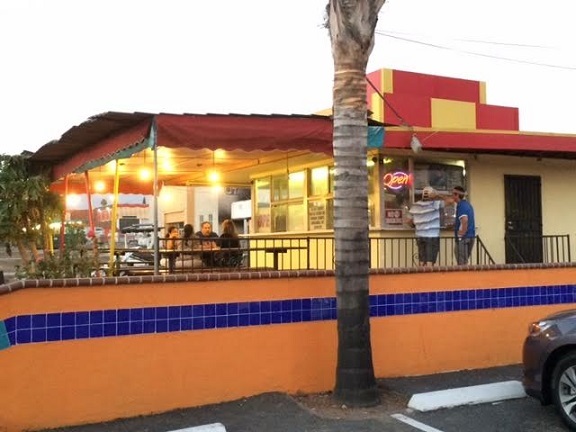 It’s a small place with a limited menu of tacos, burritos and tortas with seven meat choices: cabeza, al pastor, asada, lengua, buche, chorizo and pollo. I suppose I should try tongue, brains or cheek someday, but not yet: I went for al pastor (marinated pork) in burrito form ($5.50). With a medium jamaica drink ($1.25), dinner was $7.36 with tax. 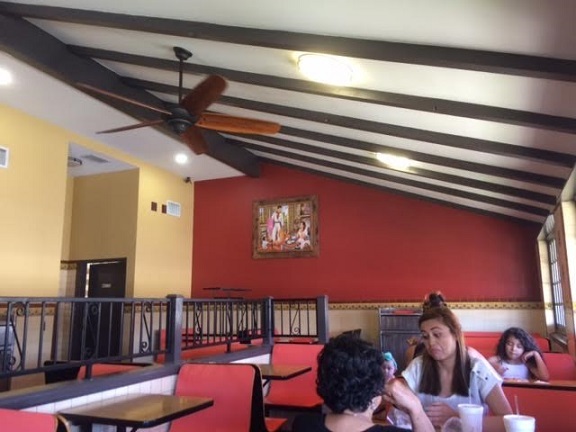 Decor is limited and so is the seating, although it feels expansive compared to Tijuana’s Tacos. 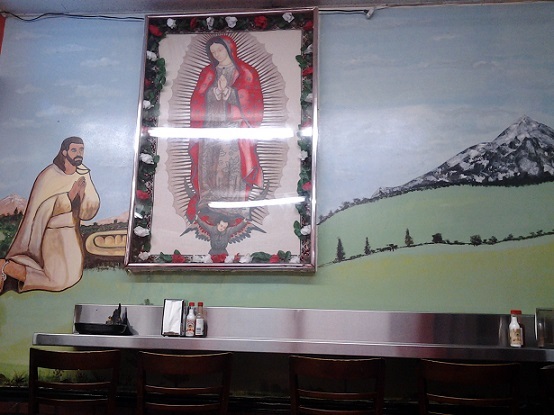 I sat at a communal booth, in view of the open kitchen, a telenovela playing on the TV and a Virgin of Guadalupe mural on one wall. 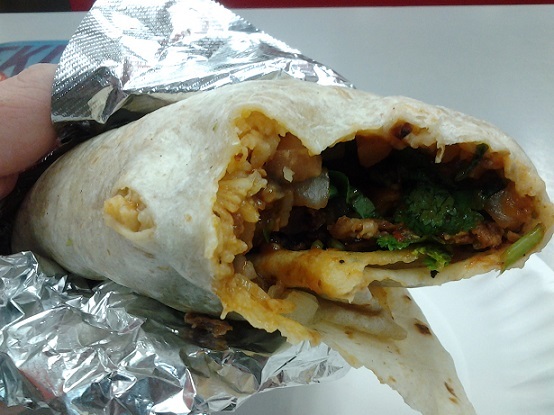 The burrito was very good, warming the stomach and the soul. 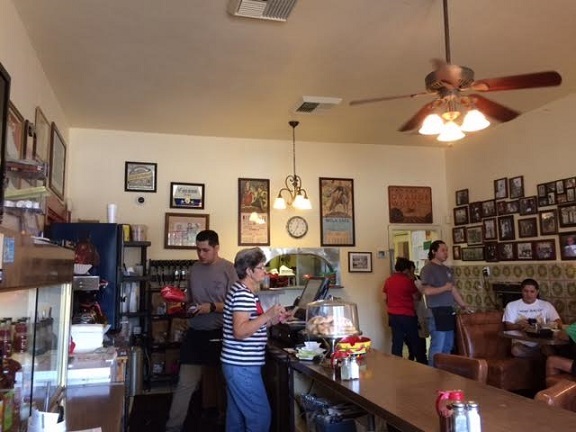 The menu is slightly broader than I indicated: They have menudo on weekends and something called carne en su jugo, which turns out to be a beef and tomato stew. Might be good on a cold night. 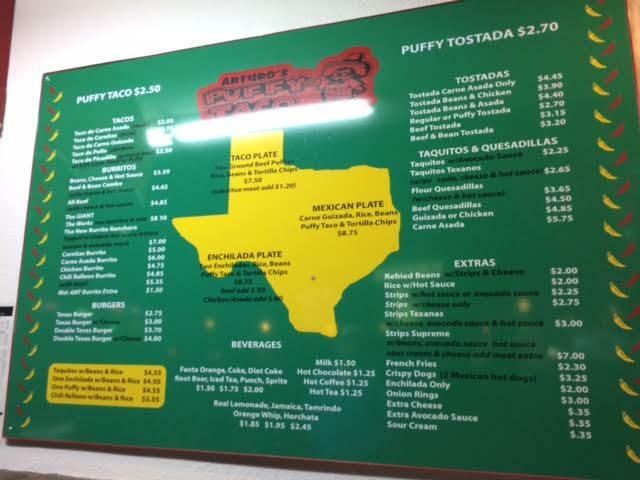 On my way out, I noticed another Mexican spot on the northeast corner. The sign was dim but the name was Taqueria la Oaxaquena. 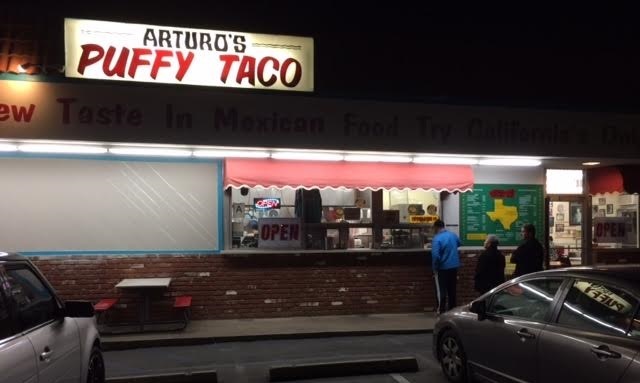 A sign out front touted 60-cent tacos on Tuesdays, which this day was. Oh well. I can always go back. 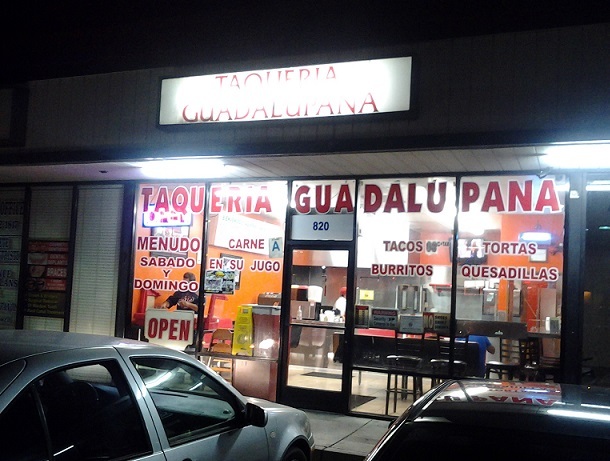 For tonight, I was glad to have found Taqueria Guadalupana. 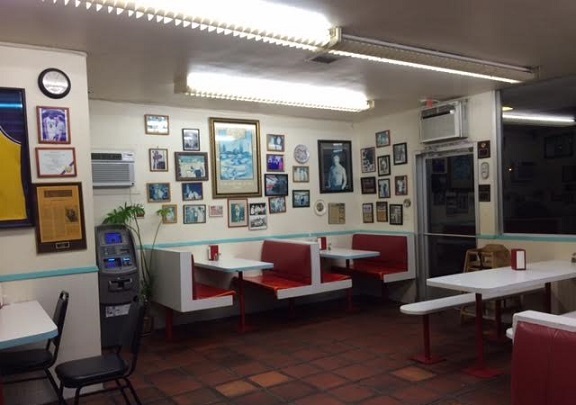 A friend recently ate at a taqueria on South Garey but couldn’t remember the name. 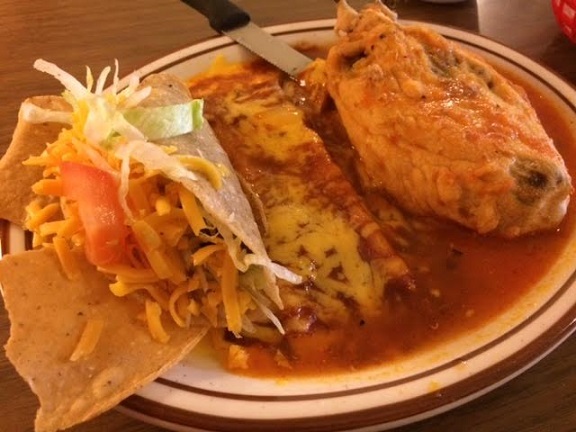 The only one I knew of was Taqueria De Anda, which I recall enjoying once maybe six years ago, but never wrote about here. I went back to try it again. 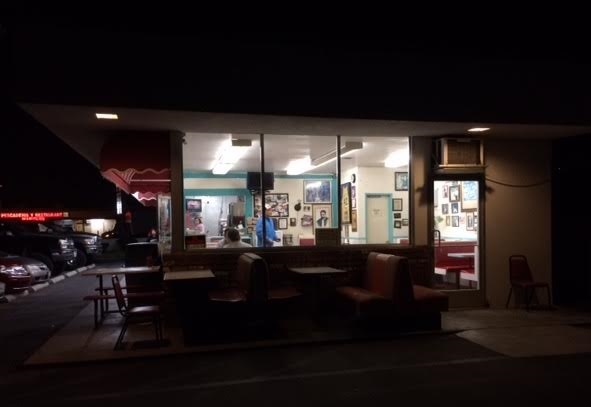 The freestanding restaurant, which has a drive-thru, is neat and clean, with tiled floors, a muted color scheme and art on the walls. And they have tables and chairs. 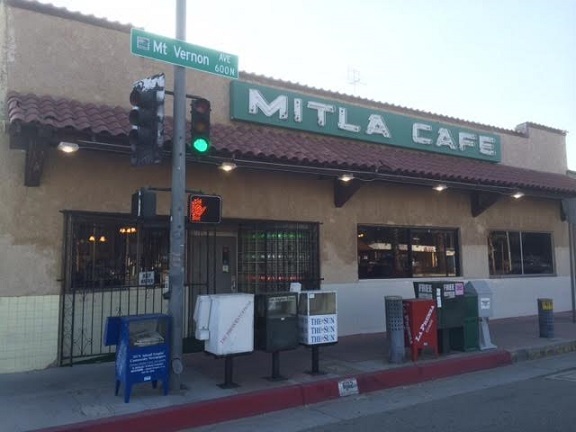 It’s relatively upscale for a 24-hour taqueria where you order at the counter directly from the cook. 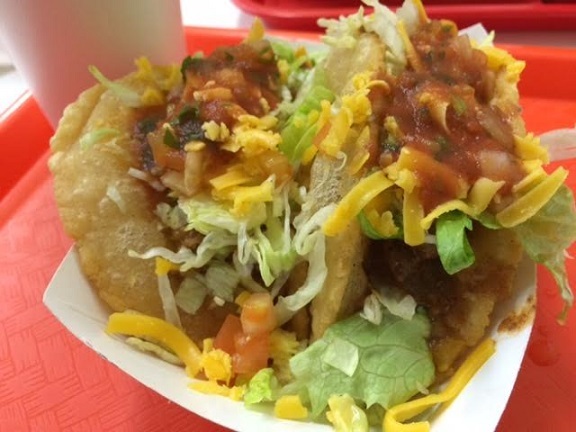 Tuesday was my lucky day: That day’s special is 99-cent tacos, cheaper than the usual $1.37. I ordered three carne asadas and a jamaica drink, for a total of $4.71. 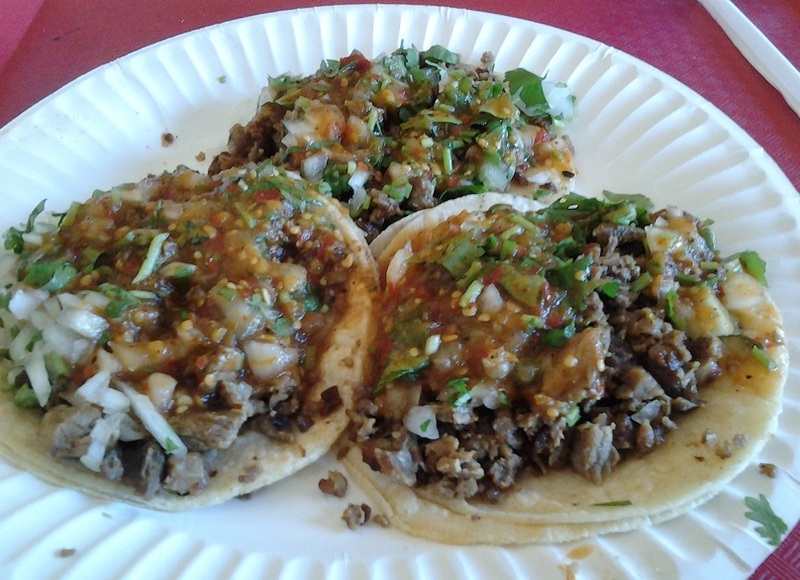 The tacos were excellent, generous with the meat and cilantro and with a tasty salsa. 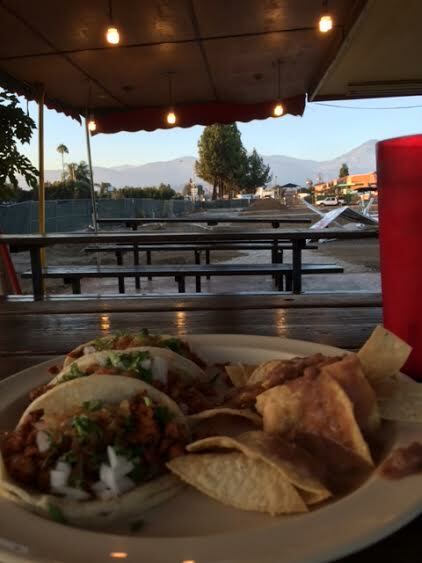 They’re some of the better tacos I’ve had in Pomona.